Last week I talked about mole salamanders and the ponds they live in. It’s not just mole salamanders using those ponds, though! Today, I thought the ponds themselves needed a post. Mole salamanders, and many other amphibians, tend to breed in what are known as ephemeral ponds, or vernal pools. Whatever you call them, they are just low spots that fill with water at certain times of year, but their temporary nature is what defines them, and what makes them an essential wildlife habitat. Even though the rainiest season in most of the South is summer, the ponds usually hold water in winter, after the late fall rains. There may be more rain in summer, but it is promptly sucked up by tree roots or evaporated in the heat. In winter, the trees are dormant and the air is cooler, so water is left to saturate the ground and pool in the hollows. How long the ponds will hold water is an important factor for wildlife. Some of the shallow pools dry in a matter of days. Others have at least a puddle at the deepest point for most of the year. In drought years, almost none of them will have any water at all. When they do fill, they’re very popular with amphibians. 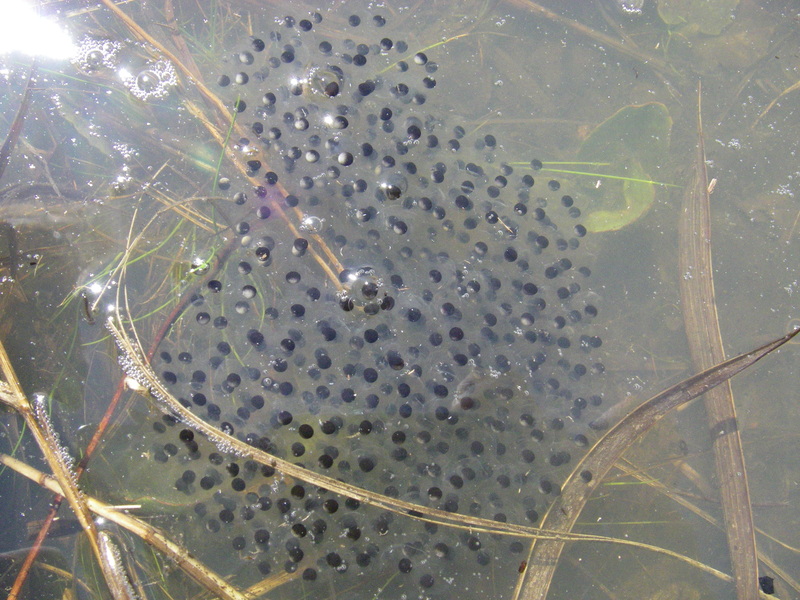 Although many (not all) amphibians live on land at some point in their lives, almost all of them have to lay their eggs in water, or at least damp places. Their eggs don’t have shells like birds and reptiles; they’re surrounded by a clear gel and will dry out if not kept moist. A larger, more reliable source of water would be great, except that large, reliable sources of water have fish, which would eat the eggs and larvae before they had a chance to mature. A lot of amphibians and insects gamble on the weather rather than the fish. As soon as the ponds start holding water, you can hear the constant chirping of chorus frogs. In a month, you can dip a net in the water and come up with three species of tadpoles, several dragonfly nymphs, many salamander larvae, and maybe a tiny mud turtle. I’ve done a lot of that. My surveys in winter were centered around ephemeral ponds. I was looking for the flatwoods salamander, and although I never found any, the methods I used caught a lot of other small animals. I set up traps around the outside of the ponds, to catch adults moving to and from the ponds during breeding season. I also used a net in the water, moving back and forth, scooping up water and mud and dead leaves and a million dragonfly larvae, but also tadpoles and salamander larvae and aquatic salamanders and newts. 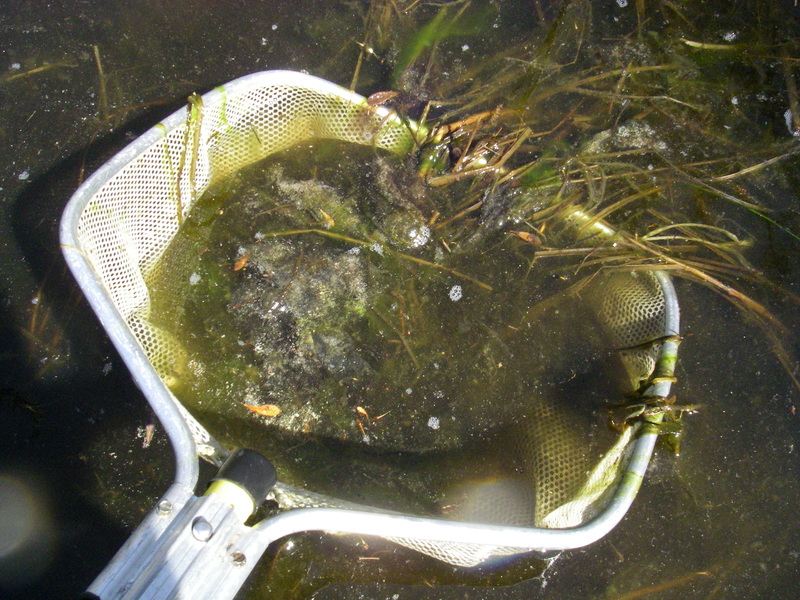 But sometimes all I got was a net full of pond scum. If you’re an amphibian who needs these pools to reproduce, a “live fast and die young” approach is not going to work; what if your one year of life is a drought year? You’re better served by a long lifespan spent mostly lurking underground. For example, the eastern newt lives over 12 years on average. That’s long enough to get away with a few unsuccessful breeding seasons. Still, if the dry winters continue long enough, populations decline. That was a concern when I worked in the Florida panhandle; the winters had been drier than average for most of the past decade. There were two years when my pond spreadsheets had a column filled with DRY, DRY, DRY, and all I could do was mend nets and enter data and wait for rain. I set the traps on days when the forecast called for rain in the evening. My standards for a good trapping night started off fairly high in October. By March, the merest hint of a cloud was enough reason to go set traps. Even on dry nights nights I’d usually catch something. A few frogs or salamanders. Maybe a lizard or two. Occasionally a pigmy rattlesnake. Once an amphiuma — a meter-long, eel-like salamander. It was so slippery I could barely get it from the trap into a bucket and then back into the water, let alone take a decent photo. If you want to see a lot of wildlife in a short time, just go walk in a flat-ish stretch of woods in the fall or early spring. Look for pools of water in depressions on the ground. In fact, you probably won’t have to search with your eyes. Just follow the frog calls. And on a wet night, sometimes I’d get something more like this. 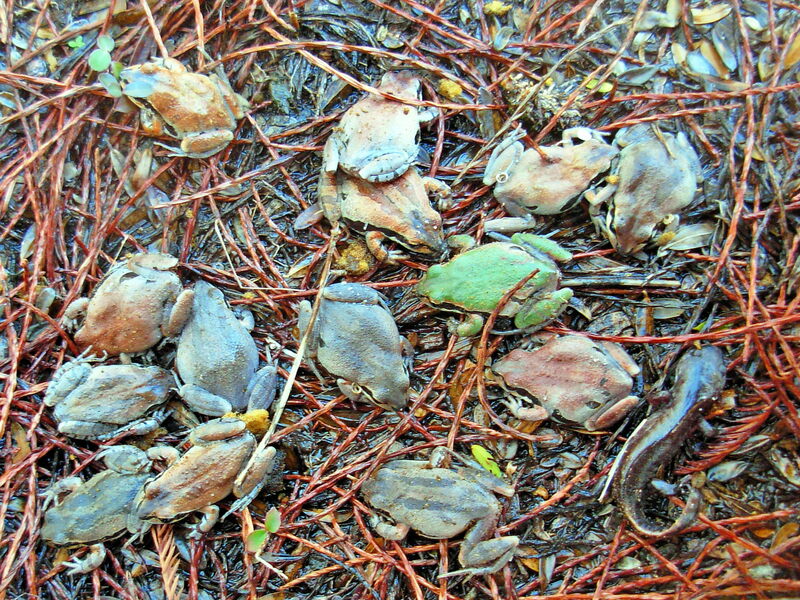 These fourteen ornate chorus frogs and one mole salamander came from the same trap. I have heard about ephemeral ponds but never knew that they had such rich biodiversity. Thank you so much for the information. You’re welcome. Thanks for the nice comment! There may be other reasons, depending on the area, but that seems to be the main advantage!